Amazing humans or WOW that's big! 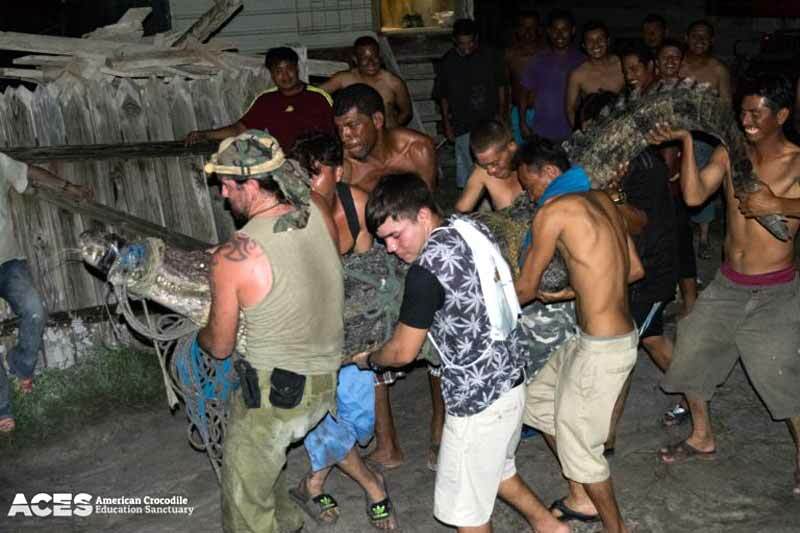 While it's easy to focus on the negative, we are happy to share the good news and praise for the incredible effort Forest Department officers and Chris Summers put in to help this rather large (10ft) croc who had fishing line wrapped around his snout. (Un? )fortunately the xrays revealed no fishing hooks or metal objects. Which is good, but also gives us no idea where the line ends. The good news is we will not have to take the risk of surgery. The bad news is that the prognosis is unclear. Here we are removing the wooden speculum after we tubed him with mineral oil (to try and make things "slide through"...) and he is biting down a bit. Thankfully he was a "mild mannered patient" so far. Fingers crossed he left our enclosure (which is NOT made for his kind and size) intact over night and fingers crossed for his recovery. 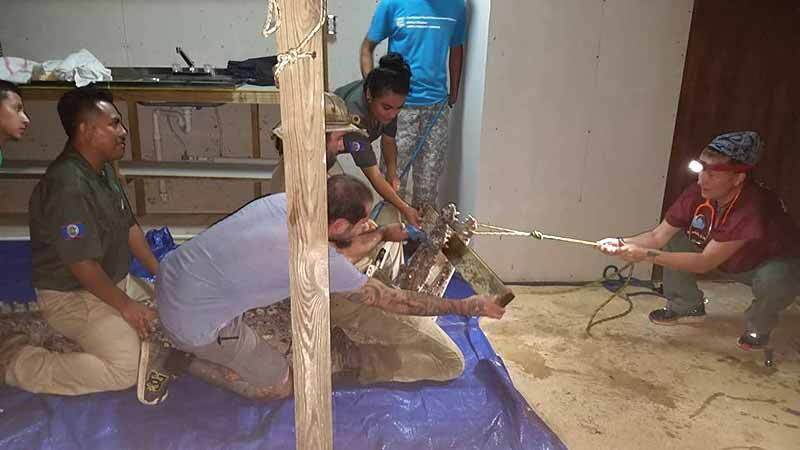 Yesterday, ACES and the Belize Forest Department transferred this 10-foot American Crocodile from Ambergris Caye to the vet's office in Cayo, as the crocodile had fishing line hanging out of his mouth and there was fear that a fishing hook was on the other end. We had some good news from Belize Wildlife & Referral Clinic, X-rays showed no hook in his belly which means risky surgery is not necessary! The bad news is that we still do not know what is causing the fishing line to be stuck, or where it ends. Thomas was given mineral oil to hopefully assist in moving along whatever it's caught on - time will tell at this point. We hope he is able to pass whatever it is he ingested and it does not cause any internal damage. Again, we would like to stress two things here - first, it is illegal (not to mention dangerous for all parties involved) to feed, harass, or attempt to catch a crocodile. These crimes are punishable with a fine of up to $10,000, and possible jail time. Second, please remember to remove any tangled and broken fishing gear so situations like this do not occur and we can protect our precious wildlife. This very stressful procedure is avoidable if we all do our part to protect mother nature.